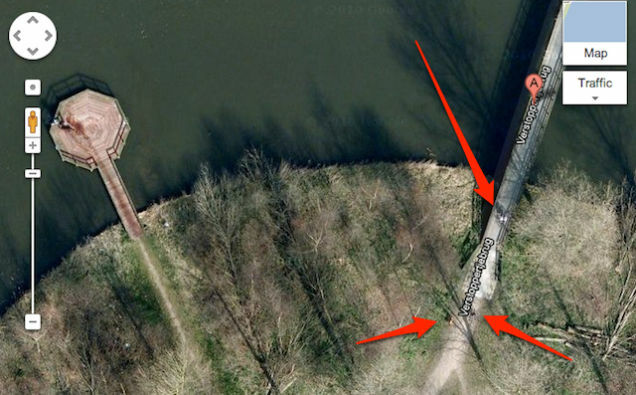 Gruesome Murder Spotted On Google Maps. A lot of things have been found on Google maps, including naked people, hit and runs and other serious crimes. But this crime spotted on Google Maps tops them all. 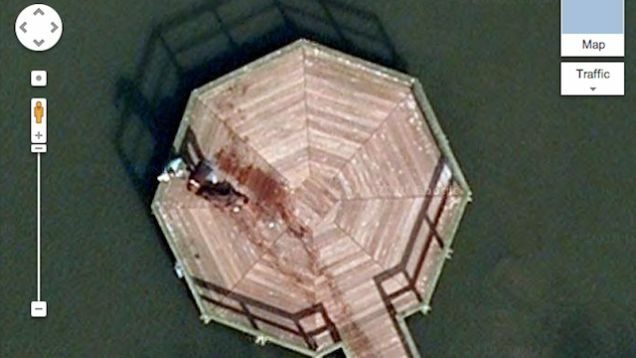 It shows what looks to be a bloody crime scene with two people dragging a corpse to the end of the pier. It looks as if they might be trying to dump the body into the water, followed by a long bloody trail. However, the body was just left at the end of the dock. Maybe they wanted their victim to be found? This is very creepy! You can see two people fleeing the scene on the right-hand side of the photo below. It looks like the man by the body might be contemplating what to do. I guess we should all be aware of the eye in the sky, it will always be watching us. “Lizard Man” Is Back In South Carolina – WATCH, Do You Believe?